There are so many different options when choosing a computer for your home office today. You have desktop, laptop, notebook, PocketPC and PDA. Do you go with PC or Mac? What about the connection types - USB or Firewire? Most shoppers are more confused leaving a computer store than when they entered it - normally due to pushy salesmen and too many choices. Even if you're an experienced computer user the speed at which technology moves can leave you behind quickly. Making a simple purchase can seem [an error occurred while processing this directive] daunting at the very least. What brand? How much should you pay? What about warranty? What type of printer is best for your working environment? 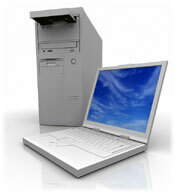 What about data backup - should it be online or offline or perhaps even both? The biggest mistake made by 90% of first time office computer buyers is listening to the sales person in their local computer store. Does that seem harsh? Well considering that many of them do their best to confuse you with techno babble in the hope of making an easy sale it does seem a fair comment. I also have a background in IT retail management so I can speak from experience here too. Let's face facts. Those guys (sales people that is) are getting paid a commission and the more you buy from them the more they make. Ethics is not a sales technique that many computer retailers have any familiarity with. Sell them the box, get them out the door and pray you don't see them again is the most common belief computer retailers share. So how do you choose your home office computer? The simple truth is that you need to be realistic and ask yourself one specific question. What tasks do you actually need your office computer to perform? If it's just basic word-processing and using the internet then you need a basic PC or Mac with an entry level printer inkjet or laser printer. If you're more into number crunching, audio and some grapical work then a mid-range PC or Mac with a photorealistic color inkjet or laser printer would suit. If you're the ultimate power user who needs the best of everything then you'll need the $6,000 super duper, gizmo laden wonderbeast from Dell or Alienware. The reality is that very, very few home office users will need a top end PC to send emai, print some documents and surf the web on. A system for $600 - $1,000 should provide you with more than enough processing power to get any home office computer task done quickly. The point being made here is purchase the computer that will adequately perform the tasks you need to complete and not purchase the "Wow" factor computer. What's the difference between a laptop and notebook computer? Learn more about the major and minor differences that laptop and notebook computers have. Should you use a laptop backpack when travelling? Are there any advantage to some of the newer laptop backpacks? Cheap laptops don't have to be inferior.... if you buy the right one! Some tips for choosing your next office printer. Learn lots more about the wonderful world of PDAs. The world of portable electronics and how it's changed business.